Whether you're looking for convenient shelter for your horses, are looking for a complete chicken coop package or want quality shelter for man's best friend, Stoltzfus Woodworks offers quality animal shelters for every need! Give your horses the shelter they deserve with a quality horse barn from Stoltzfus Woodworks. Featuring a Quaker-style roof with overhang and 30 year shingles and all-wood construction, our horse barns come in a variety of sizes to suit your needs. 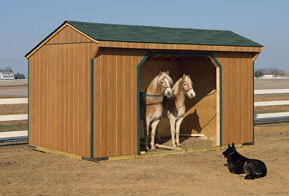 Outfit your horse barn with an optional tack room to store feed or riding gear. Choose from painted Duratemp or Board & Batten siding. Horse barns come with covered kickboard for durability and safety. The perfect shelter for grazing horses, our run-in sheds offer as-needed protection from sudden rain or other inclement weather. 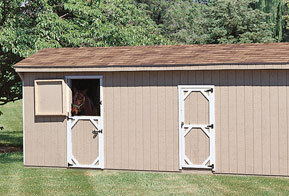 Our run-in sheds are available in a variety of sizes to accommodate a single horse or multiple horses and feature a built-in kickboard for durability and horse safety. All-wood construction, Quaker-style roof with overhang and Duratemp painted siding are all standard features on our line of quality run-in sheds. Packed with everything you need to raise happy and healthy chickens, our chicken coops are a convenient option for the farm or backyard. Featuring all-wood construction our 5x6 chicken coops are perfect for up to 10 chickens and come standard with Quaker-style roof, nesting boxes with exterior access, 2 windows, wood roosting bars, chicken door with convenient ramp and glass board flooring for easy clean-out. 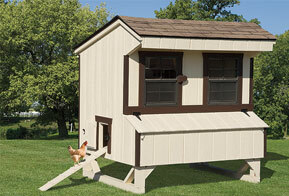 All chicken coops built with Duratemp painted siding. Give your working or hunting dogs a place to call home with a variety of dog kennels and runs from Stoltzfus Woodworks. 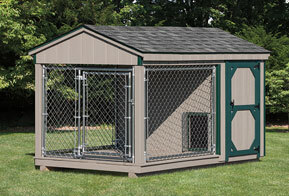 Available in sizes from 6'x10' or 8'x10' and beyond, our dog kennels feature all-wood construction, A-frame style roofing and quality chain-link fencing for secure all-weather protection your dog will appreciate.